Uranium is a complicated element as it is, but like carbon is can also form in a number of crystals structures – three have been identified to date; known as α, β and γ forms. The α and γ structures were found to be relatively simple, that is with only a few atoms in each repeating unit of the structure. However, that wasn’t the case for β Uranium, it’s a very complicated structure with 30 atoms in the basic unit cell needed to build the whole structure. At the time it was discovered, in 1951, it was thought that this structure was the same as that being discovered in some metal alloys, known as ‘σ-phases’. Though this was found not to be the case, this structure has still left many puzzling why elements (where the atoms should all be identical) would form such elaborate structures. The image of the crystal structure was built from information in the paper by Tucker and Senio in 1953, which was an improvement on their original structure determination. Two of the basic requirements of positive electrode materials for lithium ion batteries are that they must be both good electronic and good ionic conductors. This enables the material to both accept electrons from the external circuit and insert lithium ions from the electrolyte. LiFePO4 is not a good electronic or ionic conductor and yet it is the most promising positive electrode materials introduced in the last 10 years. Its success came as a result of a thorough understanding of the structural changes during lithium insertion and clever manipulation of the particle shapes and morphology. 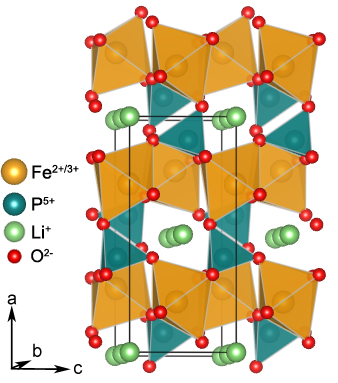 The structure of LiFePO4, which is a naturally occurring mineral called triphylite, was first explored by Bjoerling et al in 1938.1 The significance of LiFePO4 as a positive electrode material was then reported by Padhi et al.2 The LiFePO4 olivine structure is formed by a hexagonal close packed oxygen array with Li+ and Fe2+ occupying half of the octahedral sites and phosphorus occupying 1/8 of the tetrahedral sites in between the layers. Each FeO6 octahedron is corner linked to other FeO6 octahedra to form zig-zag planes running parallel to the c-axis within alternating a-c planes. In addition, one edge of the FeO6 octahedron is shared with one PO4 tetrahedron and two edges are shared with two LiO6 octahedra. The LiO6 octahedra form linear chains of edge shared octahedra between layers of FeO6 octahedra and share edges with two PO4 tetrahedra (see Figure). The electrochemical properties of LiFePO4 are strongly influenced by its structure. For example, the inductive effect of the PO4, leads to higher voltages enabling normally uninterested cations, such as iron, to be used successfully in a positive electrode material. But there are still problems, the PO4 is also responsible for the drastically reduced electronic conductivity in these materials. Further, the lithium diffuses through the material via one dimensional channels which greatly inhibits the ionic conductivity. Both of these shortcomings were overcome by preparing nanoscale LiFePO4 particles coated in a thin layer of carbon black. The increase in electronic conductivity was understood to be due to the thin carbon black layer providing a pathway for electrons from the particles to the current collector. The drastic increase in ionic conductivity, however, was not expected from a reduction in particle size. This is because the reaction was observed to proceed via a two phase conversion reaction between LiFePO4 and FePO4. Thus, the main energy barrier to lithium extraction is the seeding and growth of the second phase. A solid solution reaction, where there is a gradual conversion from LiFePO4 to FePO4 via LixFePO4 (0<x<1), on the other hand benefits from a reduction in particle size due to shorter diffusion pathways.3 It was hypothesised and then eventually proved, that the lithium insertion reaction proceeds via a pseudo-solid solution type reaction where the reaction front between the two phases is single phase LixFePO4. This behaviour is highly unusual and the main reason why LiFePO4 has become a significant new battery material. So, in future, it is likely that batteries for electric vehicles as well as portable electronic devices will contain LiFePO­4 as the positive electrode material. LiFePO4 which is #1011090 in the Crystallography Open Database. Bjoerling, C. O., Westgren, A. Minerals of the Varutrask pegmatite. IX. X-ray studies on triphylite, varulite, and their oxidation products. Geologiska Foereningens i Stockholm Foerhandlingar 60, 67-72 (1938). Padhi, A. K., Nanjundaswamy, K. S. & Goodenough, J. B. Phospho-olivines as positive-electrode materials for rechargeable lithium batteries. Journal of the Electrochemical Society 144, 1188-1194 (1997). 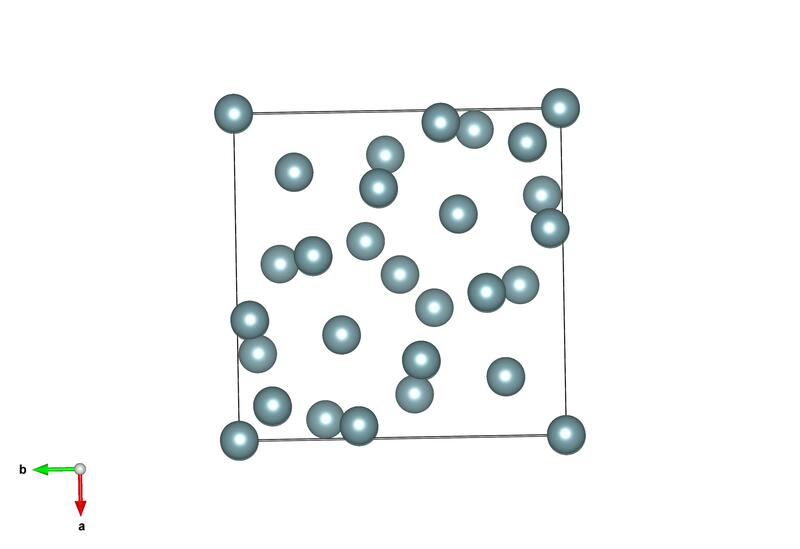 Malik, R., Zhou, F. & Ceder, G. Kinetics of non-equilibrium lithium incorporation in LiFePO4. Nat. Mater. 10, 587-590 (2011). Our latest post from Dr Dave Turner. Inspiration for compounds to include in the Crystallography365 blog can be tricky and, in my experience, tends to reflect my mood when coming up with the next topic. The structure that leapt to mind today was valium – read into that what you will. Diazepam, originally sold under the name valium since 1963 (and still commonly known as this), is a drug used to treat a variety of conditions such as anxiety, panic attacks, muscle spasms and opiate withdrawal amongst others. Diazepam is a member of the benzodiazepine family of psychoactive drugs which interact with the GABA neurotransmitter. The core structure of these drug molecules is the three rings that can be seen in the left-hand picture. 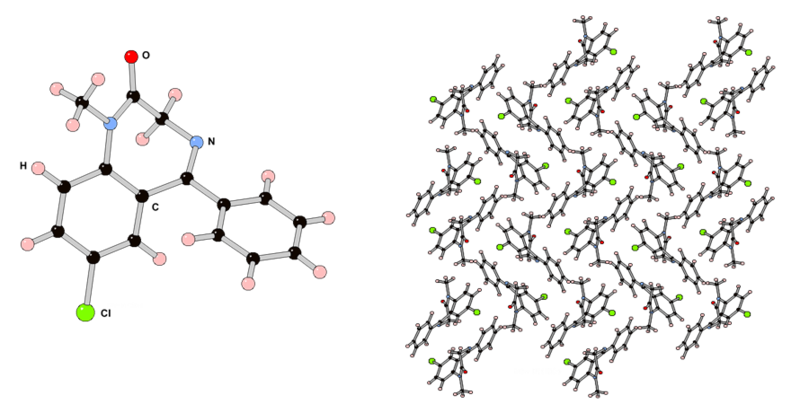 Crystals of diazepam are held together primarily by weak interactions between adjacent molecules in the absence of any charged groups or strongly polar, complementary functionalities. The structure was determined and published in the Journal of the American Chemical Society in 1972 (A. Camerman and N. Cameran, J. Am. Chem. Soc., 1972, 94, 268-272), when the full range of properties of the drug was coming to light. Understanding the geometrical structure was important to determine if and how the stereochemistry of the molecule influenced its biological behaviour. Structural determination allowed comparison with other drugs with similar properties and characterisation by crystallography remains a key part in drug design. It’s an incredibly simple molecule, but it has saved many lives and spawned a whole new generation of stuff. The phenol molecule, or carbolic acid, is a ring of six carbon atoms with a hydroxyl (a pair of oxygen and hydrogen) hanging off it. In 1865 it was used by Joseph Lister as the first antiseptic. Though it is never used now (phenol will burn the skin, and is toxic to inhale) the procedures of antiseptic surgery that Lister put in place with this small molecule prevented many infections that would have killed before. But the importance of phenol doesn’t stop there; it is an essential component of ‘Bakelite’, the world’s first plastic-like material. Synthesising phenol with formaldehyde, Leo Baekeland, produced a material that could be fused into any shape he chose and began the age of plastics! Despite the fact that pure phenol is solid at room temperature the crystal structure wasn’t established until 1987, by a group in Russia. We’ve actually chosen to feature a high-pressure polymorph of solid phenol – the molecule still stays the same under 0.16 GPa of pressure (equivalent to the pressure under a stiletto heel being worn by a moderate sized hippo), but the way it packs into a solid does change. This structure is #2103472 in the crystallography open database, and was found by Allan et al in 2002. Epsomite is a magnesium sulfate hydrate, it forms with seven water molecules for every magnesium sulfate molecule. It is a common evaporate mineral that was first identified in the caves of Epsom in Surrey, UK in 1816. Then it was first called Epsom salts and became a nice thing to put in your bath to ease aches and pains. But it’s also thought to be found on the moons of Jupiter! 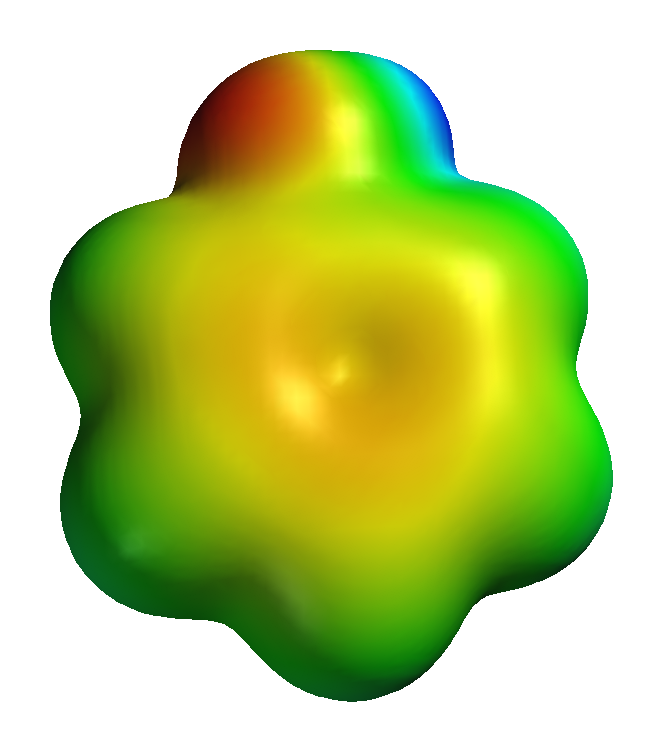 Epsomite is #1100091 in the open crystallographic database. We’ve pretty much reached the end of our journey into the centre of the Earth. Moving deeper from the post-perovskite of the ultra-low velocity zone we reached the core of our Earth. This has two very distinct parts, from about 2900 km to 5150 km under our feet this first section is the outer core. This, we know from observing how earthquake waves travel through the Earth, is liquid and probably a mixture of molten iron and nickel. At 5150 km we meet the last slice of the Earth layer cake, the inner core. This is solid, and thought to be a predominately a high-pressure form of iron, hexagonally close packed (hcp) Iron, sometimes known as hexaferrum. We’ve actually seen this structure before, when you freeze the noble gases, like Krypton, you also see this crystal structure forming. However, in reality the core is probably going to be more complex that just made of this high-pressure iron. For one thing there is a substantial amount of nickel there too, and it’s still unknown how this would effect the structure of hcp iron. Also its thought the core is actually a little lighter than you would expect, if it were made completely of iron and nickel – its long been suspected that there is a light element living there too. But what that is, has still to be discovered. The structure of hexagonally close-packed iron was first proposed by Takahashi and Bassett in 1964. The structure we’ve drawn here was determined from data collected from iron at 61 GPa of pressure and 1550 K of temperature, which is #9006657 in the open crystallography database. Just before you reach the core of the Earth (where things start to get very strange) there is an area known as the ‘ultra-low velocity zone’. The only observations that we have of the deep interior our planet are how sound waves, generated by earthquakes, move through it. That’s how the transitions to the minerals that we’ve outline so far have been discovered. But for many years what was occurring at the ultra-low velocity zone was a mystery. At this point the sound waves would slow down a great deal, indicating that something had changed in these regions. The discovery came in 2004, that silicate perovskite could transform at this pressure to an even denser ‘post-perovskite’ structure. The properties of this material have brought new understanding to the depths of our Earth. 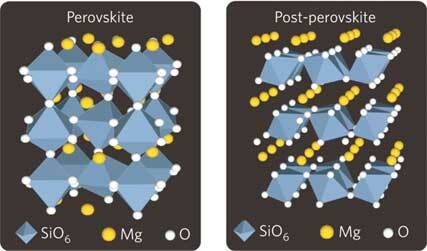 The post-perovskite structure was first discovered by Murakami et al. in 2004. There’s a great article about this discovery and its implications here.